As a deeply materialistic person I have a lot of various collectible kipple in my cubicle and at home. I like to brag about artifacts that I own, but often don’t because I am often ashamed of photos of them that I take. Well, no more. I thought about it for a while and realized that the best way to photograph my knick-knacks would be in sort of white background product catalog way. B&H has many fine lighting kits with domes, lights, boxes and backgrounds. I guess I’ll go there some day to pick one up after conferring with surly yarmulke wearing salespeople. Meanwhile I headed over to my nearest drugstore and purchased a large sheet of white construction paper. I propped it up against some books on my table, placed the first object to be photographed on it and pointed my daylight reading lamp on it. The trick to avoid reflections is to shoot from some distance with a zoom lens. 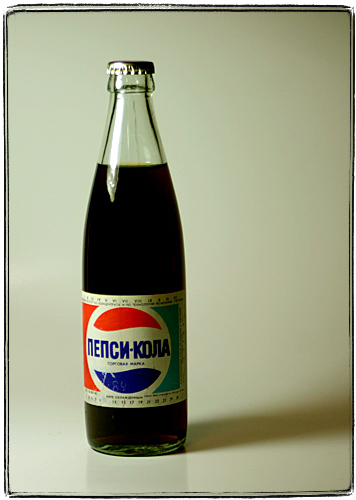 Behold: an 1989 vintage (you can kind of see the date on the label) bottle of imported Soviet Pepsi in all its glory! Still full, and even seems to have some carbonation remaining. I bet for many of you this will bring back some memories as it does for me. Also see my posts about Soviet soda and soda machines if you missed them.